I have become addicted to this biscotti recipe since I made the chocolate dipped walnut & nut biscotti last week and I have enjoyed eating them dunked in my coffee ever since. 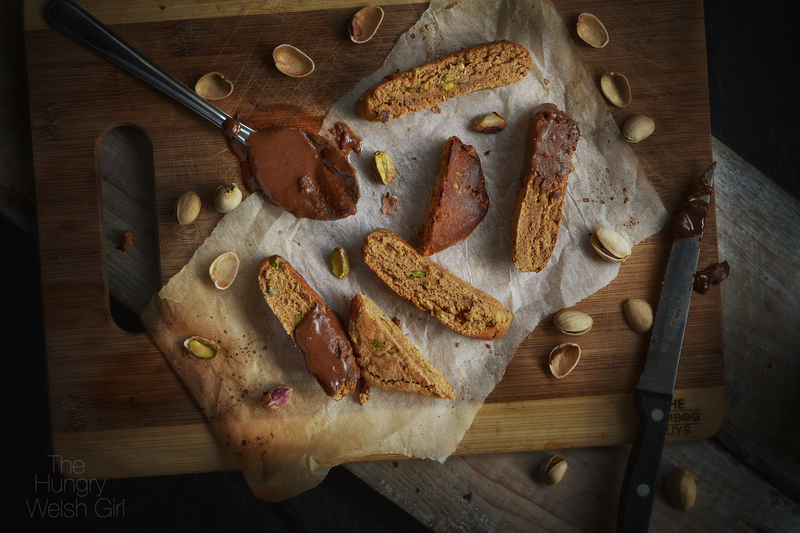 Usually biscotti are full of sugar and fat, but these peanut butter & pistachio biscotti contain all healthy fats and have no added sugar, which makes them even more addictive to eat. Just like my chunky munky protein cake, I used peanut flour in these biscotti, as well as peanut butter protein powder too and as these biscotti are versatile, you can sub the peanut flour for more protein powder, or vice versa. Heat the vitafibre syrup in a saucepan with the water, until the syrup starts to boil and foam bubbles appear on the surface. Remove the saucepan from the heat and add in the protein powder, flour and baking powder; combine the ingredients, until a dough starts to form. Pour the dough on to a plate and knead in the chopped pistachios, until they are evenly distributed throughout. Form the dough into a ‘loaf’ shape, place it on a lined greaseproof sheet and into the oven for 10-15minutes. When you remove the biscotti from the oven, leave to cool at room temperature and it will harden. Slice the biscotti into 5-6 slices and enjoy. For more recipes, reviews and ideas, follow me on Instagram – Happy.Hungry.Healthy, or Twitter – HungryWelshGirl and tag me in any of the recipes you try. I would love to see.